The term snail is used for almost all members of the class Gastropoda in the phylum Mollusca that have coiled shells as adults. Snails are popular among both fresh- and saltwater aquarists and are kept as ornamental species as well as cleaning crews. Within the marine aquarium hobby, you will encounter the terms saltwater snail / sea snail as well as the terms saltwater slug / sea slug. The term slug is a non-scientific word commonly applied to snails that have no shell, a small internal shell or a significantly reduced shell. It is for instance commonly used for the members of the suborder Nudibranchia of the class Gastropoda. 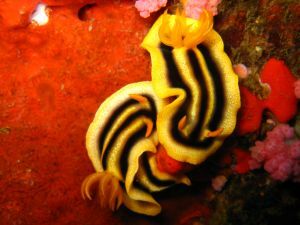 Nudibranchs, also known as sea slugs, are saltwater dwelling, soft-bodied shell-less molluscs and they are popular among marine aquarists since they tend to come in extravagant colours and shapes. Other examples of marine snails commonly referred to as slugs are the sea angles of the suborder Gymnosomata, the sea butterflies of the suborder Thecosomata, and sea hares of the suborder Anaspidea. Snails (including slugs) inhabit a wide range of different habitats in the wild and it is therefore important to choose a species that will appreciate the type of environment offered by your particular aquarium. Snails occur both on land and in fresh and brackish waters, but the greatest profusion of snail species is found in the sea. Marine snails have adapted to a wide range of different environment in the ocean and can be found even at abyssal depths. Many snails are herbivorous, but among the marine species it is fairly common to be omnivore or carnivore instead. Some snails have gills just like fishes, while others have lungs just like mammals. The snails that have developed lungs are all members of the order Pulmonata, while snails with gills are found in a lot of different orders. You might think that snails with lungs only live on land, but there is actually a handful of Pulmonata snail species to be found in the ocean. Snails that respire with lungs must of course be given access to the area above the waters edge if you wish to keep them in your aquarium since they need to surface regularly to breathe oxygen from the atmosphere. As mentioned above, snails can be kept for their beauty as well as for their ability to help with aquarium maintenance. Snails can for instance be of great aid of you are experiencing problems with excessive algae growth in the aquarium. The Margarita Snail, Margarites pupillus, is one of several species of snail known to consume large amounts of algae without hurting any corals or other invertebrates. The Margarita Snail will even devour hair algae and is completely non-venomous. If you need help with uneaten food and other types of debris in your saltwater aquarium the Nassarius Snail is one example of a snail that can be really helpful. The name Nassarius Snail is used for all the members of the genus Nassarius, but the species Nassarius vibex is the most common one in tropical saltwater aquariums. Just like most of its close relatives, Nassarius vibex is an active scavenger that will seek out left over fish food, waste products produced by your fish, and other forms of decaying organic matter. Even a small group of hungry Nassarius vibex snails can work wonders in a marine aquarium. Since they like to burrow down in the sand they will also aerate the substrate and help prevent compaction. It is however impossible to use copper-based medications in an aquarium without harming or even killing your Nassarius vibex. Nassarius vibex - How to cre for the bruissed nassa. Bumble Bee Snail - Learn more about this stunning little snail. Cerith Snails - Information on how to keep and care for Cerith snails. Chestnut Cowrie - A guide to keeping Chestnut cowries. Collonista Snails - Information on how to keep and care for collonista snails. Fighting Conch - Learn how to keep and care for fighting conch snails in marine aquariums. Margarita snails - A guide to keeping Margarita snails. Mexican Turbo Snail - Information on how to keep and care for Mexican turbo snails. Stomatella Snails - How to keep and breed stomatella snails.